In recent days, Wayne Swan has once again been loudly touting the latest IMF forecasts. He wants you to believe that what the IMF says, is somehow proof that the Australian economy under his management is doing great, and will do even better in 2012-13. But there is a very interesting, little known fact about the way in which IMF forecasts are put together. One that every citizen should be aware of. So, pointing to an IMF forecast is really nothing more than a deceitful argumentum ad verecundiam put forward by dishonest politicians, who negotiate with the “authority” they appeal to concerning what that authority’s report/forecast will actually say! Remember this little piece of information. Tuck it away near the front of your mind. Ready and waiting for the next time you hear Wayne … or any politician … or journalist … appealing to a “report” by some Higher Authority like the IMF, or the World Bank, or the UN. Haven’t read it, since I can’t be bothered logging in but this might be of interest to you. 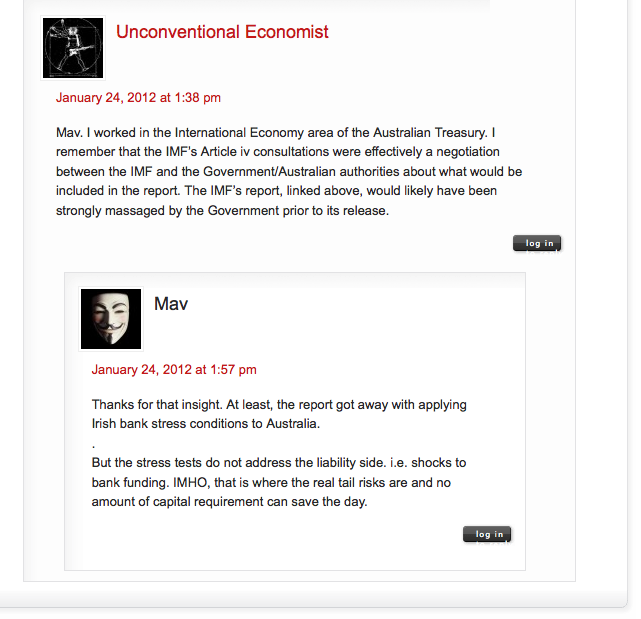 Something about “PM pressures RBA to cut rates”.